As previously mentioned, the UK and the US suffer some of the highest rates of terrorism among developed nations. 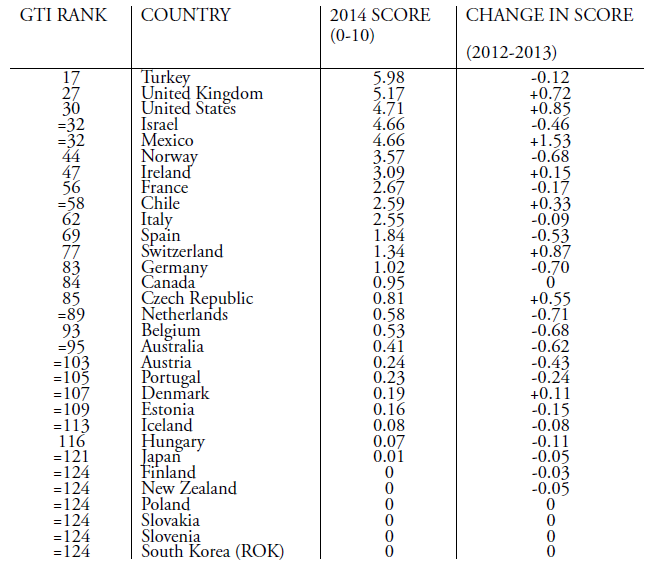 In fact, among the nations that comprise the Organization for Economic Cooperation and Development (OECD), the UK and the US rank second and third on the 2014 Global Terrorism Index, surpassed only by Turkey.61 While focusing on jihadi terrorism is of greatest import, an important finding emerged from studying instances of US radicalization: the growing rightwing terror movement. Up until December 2, right-wing terrorists killed nearly twice as many Americans as homegrown jihadists had. Even now, the International Security Project at New America says that homegrown jihadists have killed fortyfive individuals since 9/11, whereas right-wing terrorists have killed forty-eight individuals in that same time span.62 Even as the intelligence community combats today's terror threats, Western states' eyes should always be looking forward in preventing future terror attacks regardless of the ideology it springs from. We would like to believe that combating terrorism is as easy as catching perpetrators. Unfortunately, the reality is that so long as there are people who value their beliefs over human lives and there is a social movement that allows these people to be mobilized together in an absolute willingness to achieve their goals irrespective of the horror their tactics inspire, there will be a threat of terrorism. David Rapoport, the father of modern terrorism studies, describes four waves of modern terrorism reaching back to the anarchist movement in the late nineteenth century. Almost 2,000 years prior to Archduke Franz Ferdinand's assassination, the Zealots stabbed fellow Jews to protest Roman occupation of Judea in the first century CE.63 Fear is encoded in humanity's hindbrains; it is universally felt. As such, history is often written in blood and terror. Terrorists take advantage of this by exploiting vulnerable individuals and inspiring them to carry out the attacks like the midday shooting in San Bernadino. As such, counter-radicalization strategies will never completely succeed as new threats and forms of extremism emerge and evolve over time. That raises the question: why attempt something impossible? This research paper shows the crucial importance of political alienation in the creation of homegrown terrorism. It also shows the strengths and weaknesses of utilizing various strategies. Most importantly, it shows how counter-radicalization strategies can be either a unifying or dividing factor that either mitigates or exacerbates the shadow that terrorism leaves on society. The CVE strategy seeks to target a small selection of individuals and allows law enforcement to be mostly effective, albeit with questions raised about the use of agent provocateurs. The Prevent strategy casts a wide net over the land of Great Britain, calling not only law enforcement but also the everyman to prevent radicalization. It does prevent terrorism, but it also catches schoolchildren in its snare. In an Orwellian twist, it has already raised questions about its social repercussions and its likeliness to foster resentment instead of culling said sentiment at its root. This should inform administrations present and future how to proceed with counter-radicalization policies. Moreover, it should be a personal guide in understanding how to treat others in this era of courage and fear. Policy is the expression of sentiment into legislation. The US and UK need to be careful what political sentiments they encourage, just as we citizens need to be careful about how we include and exclude people from civil society through our words and actions. Our lives and wellbeing depend on it. Ashour, Omar. "Online De-Radicalization? Countering Violent Extremist Narratives: Message, Messenger and Media Strategy." Perspectives on Terrorism 4 no. 6 (2012): 15-19. Buchanan, Rose Troup. "Paris terror attack: Husband pays touching tribute to ‘love of his life' in defiant message to attackers." The Independent, 19 November 2015. http://www.independent.co.uk/news/world/europe/paris-terrorhusband-pays-touching-tribute-to-love-of-his-life-in-defiant-message-to-attackersa6737231.html. Building Communities of Trust Initiative. Building Communities of Trust: Fact Sheet. Published January 2014. Gardham, Duncan. "Andrew Ibrahim: How a public schoolboy became a terrorist." The Telegraph, 18 July 2009. http://www.telegraph.co.uk/news/uknews/ terrorism-in-the-uk/5850765/Andrew-Ibrahim-How-a-public-schoolboy-became-aterrorist.html. Gardham, Duncan. "Terrorist Andrew Ibrahim was turned in by the Muslim community." The Telegraph, 18 July 2011. http://www.telegraph.co.uk/news/5851168/Terrorist-Andrew-Ibrahim-was-turned-in-by-the-Muslim-community.html. Gunaratna, Rohan and Cleo Haynal. "Current and Emerging Threats of Homegrown Terrorism: The Case of the Boston Bombings." Perspectives on Terrorism 7 no. 3 (2013): 44-63. Her Majesty's Government. Prevent Strategy. June 2011. Institute for Economics & Peace. Global Terrorism Index 2014. http://www.visionofhumanity.org/sites/default/files/Global%20Terrorism%20Index%20Report%20 2014_0.pdf. International Security Program. "Homegrown Extremism: Deadly Attacks Since 9/11." New America. http://securitydata.newamerica.net/extremists/deadly-attacks.html. Jacobson, Michael. "Terrorist Drop-outs: One Way of Promoting a Counter-Narrative." Perspectives on Terrorism 3 no. 2 (2009): 12-17. Khaleeli, Homa. "'You worry they could take your kids': is the Prevent strategy demonizing Muslim schoolchildren?" The Guardian, 23 September 2015. http://www.theguardian.com/uk-news/2015/sep/23/prevent-counter-terrorismstrategy-schools-demonising-muslim-children. Kirk, Ashley. "Iraq and Syria: How many foreign fighters are fighting for ISIL?" The Telegraph, 12 August 2015. http://www.telegraph.co.uk/news/worldnews/islamic-state/11770816/Iraq-and-Syria-How-many-foreign-fightersarefighting-for-Isil.html. Levitz, Jennifer. "Boston Marathon Bomber Dzhokhar Tsarnaev Sentenced to Death, Apologizes to Victims." Wall Street Journal, 24 June 2015. http://www.wsj.com/articles/dzhokhar-tsarnaev-apologizes-before-being-sentencedto-death-for-boston-bombing-1435170191. McCauley, Clark and Sophia Moskalenko. "Mechanisms of Political Radicalization: Pathways Toward Terrorism." Terrorism and Political Violence 20 no. 3 (2008): 415-433. McCauley, Clark and Sophia Moskalenko. "Toward a Profile of Lone Wolf Terrorists: What Moves an Individual From Radical Opinion to Radical Action." Terrorism and Political Violence 26 no. 1 (2014): 69-85. Mueller, John. 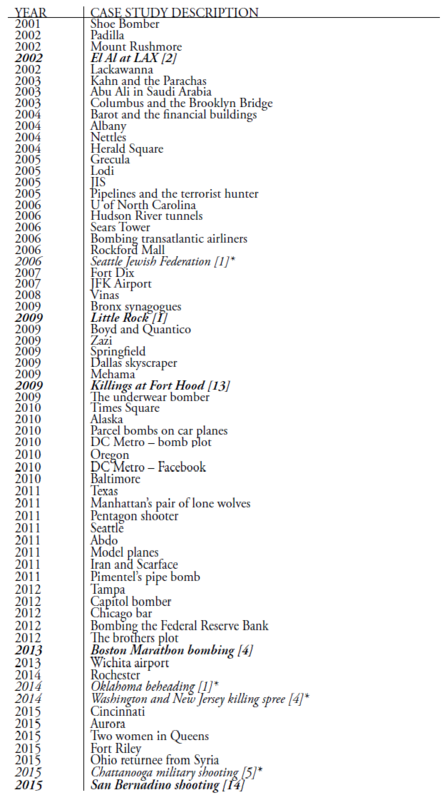 Terrorism Since 9/11: The American Cases (2015), http://politicalscience.osu.edu/faculty/jmueller/since.html. Neumann, Peter R. "The trouble with radicalization." International Affairs 89 no. 4 (2013): 873-893. New York Times. "Obama's Oval Office Speech." 6 December 2015. http://www.nytimes.com/2015/12/07/us/obamas-oval-office-speech.html. Office of the White House. Empowering Local Partners to Prevent Violent Extremism in the United States. August 2011. Office of the White House. Strategic Implementation Plan for Empowering Local Partners to Prevent Violent Extremism in the United States. December 2011. Popper, Karl. The open society and its enemies, vol. 1: The spell of Plato, 4th ed., 293. London: Routledge, 1995. Roy, Olivier. "Al-Qaeda: A True Global Movement," in Jihadi Terrorism and the Radicalisation Challenge: European and American Experiences, 2nd ed., edited by Rik Coolsaet, 19-25. Surrey: Ashgate, 2011. Sly, Liz. "Al-Qaeda disavows any ties with radical Islamist ISIS group in Syria, Iraq." Washington Post, 3 February 2014. https://www.washingtonpost.com/world/middle_east/al-qaeda-disavows-any-ties-with-radical-islamist-isis-group-insyriairaq/2014/02/03/2c9afc3a-8cef-11e3-98ab-fe5228217bd1_story.html. Sputnik International. "FBI, Homeland Security Arrest Some 70 ISIL-Related Persons in US." 21 October 2015. http://sptnkne.ws/Wva. Adrienne Ou is a fourth-year undergraduate at UCLA, majoring in political science with a focus in international relations. Her research interests include terrorism, national security, and East Asian politics. Rose Troup Buchanan, "Paris terror attack: Husband pays touching tribute to ‘love of his life' in defiant message to attackers," The Independent, 19 November 2015, http://www.independent.co.uk/news/world/europe/paris-terror-husband-pays-touching-tribute-to-love-ofhislife-in-defiant-message-to-attackers-a6737231.html. Commenters "KField" and "oldwease," in response to Buchanan's "Paris terror attack" piece in The Independent, 19 November 2015, http://www.independent.co.uk/news/world/europe/paris-terror-husband-pays-touching-tribute-to-love-of-his-life-in-defiant-message-toattackersa6737231.html. Peter R. Neumann, "The trouble with radicalization," International Affairs 89:4 (2013): 887. Peter Neumann calls this method the "Anglo-Saxon method." However, the term "AngloSaxon" has traditionally referred to people of British origin, which is confusing in this context because the UK represents the European method. Hence, I have renamed "Anglo-Saxon" to "North American" for clarification purposes. Peter R. Neumann, "The trouble with radicalization," International Affairs 89:4 (2013): 873. Neumann, "The trouble with radicalization," 885-886. Quote from page 886. Karl Popper, The open society and its enemies, vol. 1: The spell of Plato, 4th ed. (London: Routledge, 1995), 293. Neumann, "The trouble with radicalization," 888. Clark McCauley and Sophia Moskalenko, "Mechanisms of Political Radicalization: Pathways Toward Terrorism," Terrorism and Political Violence 20, no. 3 (2008): 418. Liz Sly, "Al-Qaeda disavows any ties with radical Islamist ISIS group in Syria, Iraq," Washington Post, 3 February 2014, https://www.washingtonpost.com/world/middle_east/alqaedadisavows-any-ties-with-radical-islamist-isis-group-in-syria-iraq/2014/02/03/2c9afc3a-8cef11e3-98ab-fe5228217bd1_story.html. McCauley and Moskalenko, "Mechanisms of Political Radicalization," 427. Clark McCauley and Sophia Moskalenko, "Toward a Profile of Lone Wolf Terrorists: What Moves an Individual From Radical Opinion to Radical Action," Terrorism and Political Violence 26, no. 1 (2014): 71. Omar Ashour, "Online De-Radicalization? Countering Violent Extremist Narratives: Message, Messenger and Media Strategy," Perspectives on Terrorism 4, no. 6 (2012): 15-19. Michael Jacobson, "Terrorist Drop-outs: One Way of Promoting a Counter-Narrative," Perspectives on Terrorism 3, no. 2 (2009): 12-17. Ashour, "Online De-Radicalization?" 15 & 17. Lorenzo Vidino, "Countering Radicalization in America: Lessons from Europe," United States Institute of Peace, Special Report 262, November 2010, http://www.usip.org/sites/default/files/SR262%20-%20Countering_Radicalization_in_America.pdf. 10. Building Communities of Trust Initiative, Building Communities of Trust: Fact Sheet, January 2014. Office of the White House, Empowering Local Partners to Prevent Violent Extremism in the United States, August 2011. HM Government, Prevent Strategy, June 2011. For an example of the incompleteness of counter-terrorism statistics and how confidential information affects terrorism studies, note the number of detections that were labeled as "unclear/unknown" in Figure 1.5. Here, New America lists four jihadi terrorist attacks not included in Mueller's compendium. In order to keep the paper consistent, these attacks and their casualties have not been included here. However, the San Bernadino shooting casualties on 2 December 2015 have been included. The International Security Program, "Homegrown Extremism: Deadly Attacks Since 9/11," New America, http://securitydata.newamerica.net/extremists/deadly-attacks.html. "FBI, Homeland Security Arrest Some 70 ISIL-Related Persons in US," Sputnik International, 21 October 2015, http://sptnkne.ws/Wva. Ashley Kirk, "Iraq and Syria: How many foreign fighters are fighting for ISIL?" The Telegraph, 12 August 2015, http://www.telegraph.co.uk/news/worldnews/islamicstate/11770816/Iraq-and-Syria-How-many-foreign-fighters-are-fighting-for-Isil.html. Kirk, "Iraq and Syria," The Telegraph, 12 August 2015. Lorenzo Vidino, "Countering Radicalization in America." 9. John Mueller, Terrorism Since 9/11: The American Cases (2015), 688-690, http://politicalscience.osu.edu/faculty/jmueller/since.html. Rohan Gunaratna and Cleo Haynal, "Current and Emerging Threats of Homegrown Terrorism: The Case of the Boston Bombings." Perspectives on Terrorism 7, no. 3 (2013): 55. Duncan Gardham, "Andrew Ibrahim: How a public schoolboy became a terrorist," The Telegraph, 18 July 2009, http://www.telegraph.co.uk/news/uknews/terrorism-in-theuk/5850765/Andrew-Ibrahim-How-a-public-schoolboy-became-a-terrorist.html. Duncan Gardham, "Terrorist Andrew Ibrahim was turned in by the Muslim community," The Telegraph, 18 July 2011, http://www.telegraph.co.uk/news/5851168/Terrorist-AndrewIbrahim-was-turned-in-by-the-Muslim-community.html. Peter Bergen, David Sterman, Emily Schneider, and Bailey Cahall, "Do NSA's Bulk Surveillance Programs Stop Terrorists?" New America Foundation, January 2014. 5. "Intelligence Collection Disciplines (INTs)," Federal Bureau of Investigation, accessed 2 April 2016, https://www.fbi.gov/about-us/intelligence/disciplines. HM Government, Prevent Strategy, 2011, 56. Narrative borrowed from McCauley and Moskalenko. Jocelyne Cesari, "Muslims in Europe and the US: A Shared but Overrated Risk of Radicalism," in Jihadi Terrorism and the Radicalisation Challenge: European and American Experiences, 2nd ed., ed. Rik Coolsaet (Surrey: Ashgate, 2011), 106 & 111. Gunaratna and Haynal, "Current and Emerging Threats of Homegrown Terrorism," 46-47. Jennifer Levitz, "Boston Marathon Bomber Dzhokhar Tsarnaev Sentenced to Death, Apologizes to Victims," Wall Street Journal, 24 June 2015, http://www.wsj.com/articles/dzhokhar-tsarnaev-apologizes-before-being-sentenced-to-death-for-bostonbombing1435170191. Homa Khaleeli, "'You worry they could take your kids': is the Prevent strategy demonizing Muslim schoolchildren?" The Guardian, 23 September 2015, http://www.theguardian.com/uknews/2015/sep/23/prevent-counter-terrorism-strategy-schools-demonising-muslim-children. Gunaratna and Haynal, "Current and Emerging Threats of Homegrown Terrorism," 55. Brian Masters, "Anders Breivik isn't mad – he was a man on a mission," The Telegraph, 16 April 2012, http://www.telegraph.co.uk/news/worldnews/europe/norway/9206958/AndersBreivik-isnt-mad-he-was-a-man-on-a-mission.html. Yanan Wang and Niraj Chokshi, "'You ain't no Muslim, bruv': David Cameron champions rallying cry against Islamophobia," Washington Post, 7 December 2015, https://www.washingtonpost.com/news/morning-mix/wp/2015/12/07/you-aint-no-muslim-bruv-britschampionrallying-cry-against-islamophobia/. Vidino, "Countering Radicalisation in America," 10-11. Office of the White House, Strategic Implementation Plan for Empowering Local Partners to Prevent Violent Extremism in the United States, December 2011. 1. For a more detailed analysis of this phenomenon, see: Bill Bishop and Robert G. Cushing, The Big Sort: Why the Clustering of Like-Minded America is Tearing Us Apart, Boston: Mariner Books, 2009. Institute for Economics and Peace, Global Terrorism Index, 2014.
International Security Project, "Homegrown Extremism: Deadly Attacks Since 9/11," New America, http://securitydata.newamerica.net/extremists/deadly-attacks.html. Richard A. Horsley, "The Sicarii: Ancient Jewish ‘Terrorists'," The Journal of Religion 59 no. 4 (1979): 435-458. The following data set is excerpted from the 2014 Global Terrorism Index, prepared by the Institute for Economics & Peace. Countries here are ordered in the ranking from most likely to suffer from terrorist attacks to least likely. It does not reflect any attack that happened in 2015; as such, the rankings for France and Belgium are not updated to reflect current events. Source: Institute for Economics & Peace. Global Terrorism Index 2014. http://www.visionofhumanity.org/sites/default/files/Global%20Terrorism%20Index%20Report%202014_0.pdf. This is the data set used to determine statistics in the "Combating Terrorism in Our Backyards" section and chart the "Jihadi Terror Attacks & Attempts in the US since 9/11" graph. It is a combination of the efforts of John Mueller and New America's International Security Program. Boldfaced and italicized case studies indicate that the terror plot succeeded and killed individuals. The number of casualties is included in brackets at the end. * These cases were included in the list of lethal jihadi attacks in New America's list, but were not included in Mueller's list of case studies. They have been excluded from the paper's statistics. Sources: (1) International Security Program. "Homegrown Extremism: Deadly Attacks Since 9/11." New America. http://securitydata.newamerica.net/extremists/deadly-attacks.html. (2) Mueller, John. Terrorism Since 9/11: The American Cases (2015). http://politicalscience.osu.edu/faculty/jmueller/since.html.